Rycote's 'InVision USM' universal studio microphone mount (reviewed in SOS March 2010) is an ingenious and remarkably effective shockmount system that uses four 'Lyre' suspension brackets to support large‑diaphragm side‑address microphones. The innovative and unique Lyre concept was first seen in 2007, when it was introduced for small- and medium‑diaphragm mic suspensions, and it has been proven to be an extremely successful and efficient design. The original InVision USM model, which accommodates mic diameters of 18-55 mm and weights of between 400 and 750g, has been complemented with a second version optimised for lightweight mics. Called the USM‑L, this new model accommodates the same body diameters, but has more flexible Lyres, to provide optimum isolation for mics weighing less than 400g. The Rycote boffins are also working on versions to accommodate much larger and heavier microphones! The latest addition to the InVision system is a neat Universal Pop Filter attachment which, like all Rycote products, takes an unusual but technically astute approach to the problem. This new pop shield is available either as part of a full 'Studio Kit' (with either a USM or USM‑L mount), or it can be purchased separately, and replacement foam inserts are also available. Although designed primarily to fit Rycote's USM‑style mount, the attachment hardware is versatile enough for it to be used on most other shockmount designs too, if required. The large oval pop‑filter frame is constructed from a tough but flexible ABS nylon-blend plastic that doesn't ring or resonate at all. It measures roughly 160x130 mm, weighs just 61g, and is supported by a G‑clamp attachment at the bottom, with a rotatable fitting so that it can be moved out of the way to access mic switches easily. The G‑clamp fixes firmly to the USM's outer support ring using the same kind of finger‑screw as on the USM mount itself, and the mic can be removed or installed in the USM mount with the pop shield remaining in place. 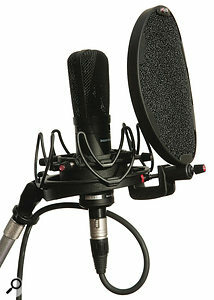 The pop shield sits perfectly in front of the installed mic's capsule, spaced away by about 100mm, the exact distance depending on the mic diameter. This spacing is a practical compromise that maximises the distance (which also maximises the pop‑stopping ability) without necessitating an excessively large pop shield. The pop shield itself is made from a 10mm‑thick, open‑cell foam pad, and this is held firmly in place by a series of plastic tabs on the front and rear surfaces of the oval support ring. This arrangement allows the foam to be removed quickly and easily for cleaning or replacement, yet holds it firmly in place when in use. The open‑cell foam is remarkably effective in controlling plosive blasts — test measurements have shown a 20dB reduction compared to no filter at all — yet it introduces a negligible HF roll‑off (0.25dB at 20kHz), unlike the more familiar double‑mesh nylon pop shields, which can have an audible effect. Universal Studio Kit (USM or USM‑L with Pop Filter), £95; Universal Pop Filter, £35 each; replacement pack of five foam inserts, £8.70. Prices include VAT. Universal Studio Kit (USM or USM‑L with Pop Filter), $149.99; Universal Pop Filter, $49.95 each; replacement pack of five foam inserts, $12.99.